Ever wondered how Facebook works? Whether you’re a developer or just interested in “How stuff works”, a new product from Apigee could be right up your street. We covered Apigee, from Sonoa Systems, previously when it launched an easy way for beginners and experienced developers alike to explore the Twitter API without having to wrestle with confusing documentation. Today the team have launched something similar for Facebook’s Open Graph API, but this time they’ve made life even easier. 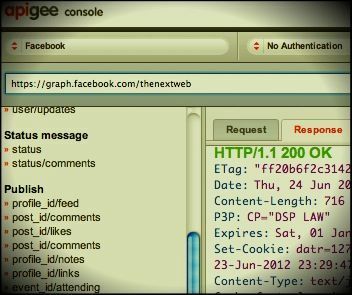 Apigee allows you to browse Facebook as the API sees it, offering a very different look at the site from the familiar blue and white user-facing view. You can access users’ profiles both as a logged-in or logged out user and click on any part of the API that interests you. Hyperlinks between different parts of the API allow you to explore how Facebook’s complex network is put together. Apigee gives you a fascinating look ‘under the hood’ of the service and you can log straight in with your Facebook account and give it a go. When you want to get more involved with developing an app for Facebook, Apigee is a fully featured development console. It offers useful features like a Facebook style ‘awesome bar’ that autocompletes API calls. If you’re bogged down in guides on Facebook’s Developer site, you can use a bookmarklet to jump from any part of the documentation straight into Apigee to see how it looks on the site. If you have a problem with a piece if code, you can generate a link to share with others so they can jump straight into your code to help figure out the problem, while a history feature lets you jump forward and back between different versions of the code you’re working on. The video below from the company explains the service in a more detail. Sonoa plans to make these features available for more big APIs in the future. You can log straight into Apigee for Facebook with your Facebook account here.